Sympathetic nervous system is related to flight or flight situations while parasympathetic is predominant during relax conditions. Nervous system consists of central nervous system and peripheral nervous system. Peripheral nervous system is divided into somatic and autonomic nervous system. Autonomic system is further divided into sympathetic and parasympathetic nervous system. 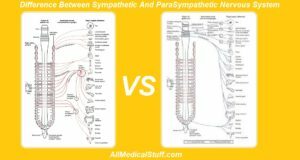 Sympathetic and parasympathetic nervous system, both are opposite to each other. Sympathetic nervous system can be also called adrenergic and parasympathetic can be called cholinergic. However sympathetic nervous system is not pure adrenergic but majority are adrenergic. While parasympathetic is purely cholinergic. This is explained in detailed below as well as other differences. 12 GIT Decreases the activity of gut i.e decreases GI blood flow, decreases movements Increases all GI activity i.e increases GI Blood flow, Increases GI Secretions, Increases GI motility, relaxes GI sphincters. As mentioned above only sympathetic nervous system has cholinergic in pregangloinic and sweat glands etc. All other of its fibers are adrenergic. While parasympathetic system is purely cholinergic. This is very important to learn as a medical student. Sympathetic nerves arise from thoraco-lumber region that is from first thoracic and ends in third lumber. While in case of parasympathetic, they arise from cranio-sacral region. All the parasympathetic cranial nerves i.e oculomotor, facial, glossopharyngeal and vagus nerves are cranial in origin. While those that arise from sacral segment of spinal cord arise from second to fourth sacral segments. Recommended: Learn the names of cranial nerves with these mnemonics. Sympathetic nerves has short presynaptic fibres while that of parasympathic are large. 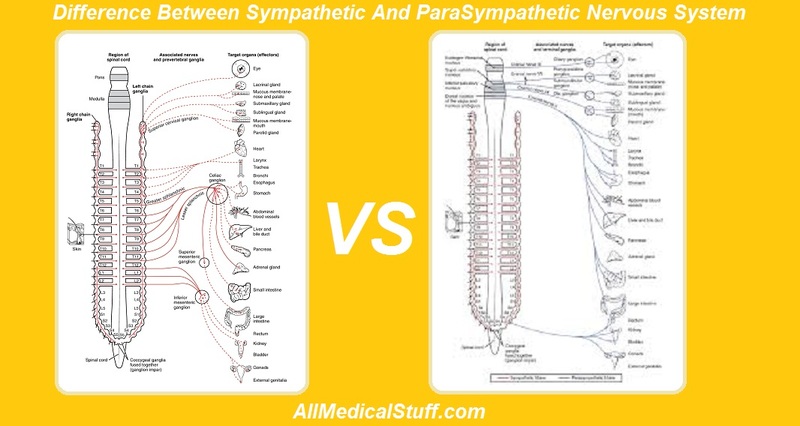 Post synaptic nerves of sympathetic system are large while that of parasympathetic are short. The reason is that sympathetic ganglia are near to spinal cord while that of parasympathetic system is near to target organs. Pre gangloinic fibers of sympathetic system are extensively branched while this is not true in case of parasympathetic nerves. Sympathetic nervous system is widely distributed to majority of the organs of the body. While this is not true in the case of parasympathetic, they have limited distribution to some organs which can be interpreted from the parasympathetic nerves. Sympathetic system has diffuse response while that of parasympathetic is discrete. Neurotransmitter of sympathetic system is mainly epinephrine. While that of parasympathetic is ONLY Acetylcholine. Normally the body functions because of the balance between sympathetic and parasympathetic. But sympathetic is dominant in emergency states i.e in flight or flight cases. While parasympathetic is predominant in relax states. Sympathetic system increases rate of hear causing tacycardia. While parasympathetic system decreases heart rate causing bradycardia. Sympathetic system causes broncho dilation while parasympathetic causes its opposite effects i.e broncho constriction. Parasympathetic stimulation causes constriction of pupil while sympathetic causes pupil dilation. Sympathetic activation increases blood supply to skeletal muscles and heart therefore decreasing gut blood supply and movements. While parasympathetic system increases gut blood supply, its movements and secretions. Parasympathetic stimulation increases salivary sections while sympathetic decreases them. Parasympathetic system increases urinary output while sympathetic decreases it.